Because it’s that time of year when the sun shines and the holidays are upon us, camping is our number one priority. 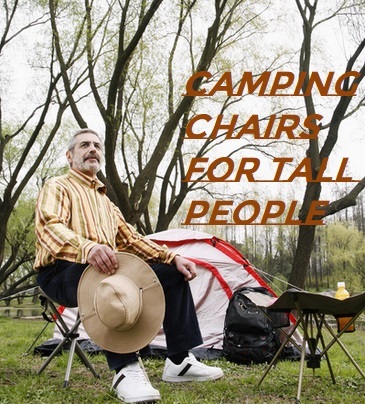 As a taller person, camping can have its limitations. One of them being sleeping. Finding adequate sleeping bags for tall people can often seem like a endless choir. Many manufactures forget that we are not all 5 foot tall. 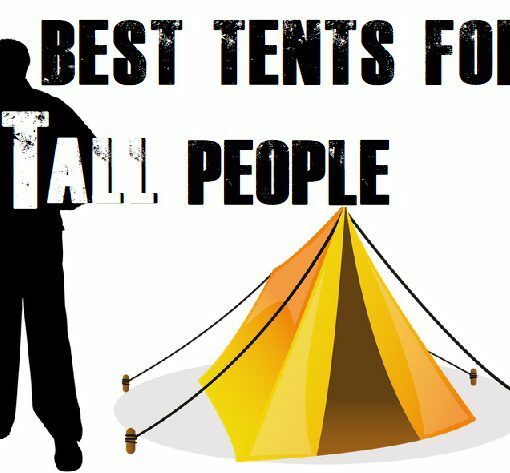 Us tall people love to camp to you know. We need to stay warm in our extra long hammocks without being exposed to the cold weather. Mini rant over. The good news is that there are tall sleeping bag options available to buy. More specifically online as you get a greater range of products to choose from. I find that when I go to my local outdoors shop or one of the big box stores, I’m greeted with two or three choices when it comes to sleeping bags. Sometimes you can get lucky and find a sleeping bag that is suitable for big foot, but more often than not they will be too short. This is why I tend to buy my taller gear online. There’s just way more options to choose from. So if you plan ahead and order your camping gear a few days before you take off, life is good. 1.2 Rectangle Vs Mummy Sleeping Bags – Which Is Best For you? 6.2 Is The Colossal Worth The Money? Before you go and buy the first 7 foot sleeping bag you see, it’s important to understand that there are categories in which a sleeping bag is rated. So depending on when and where you plan to camp may impact on the type of sleeping bag you buy. Similar to buying a tent for tall people. Not all tents are designed for Summer for example. Size is also important. If you’re tall yet slender, you;re not going to need a sleeping bag for the big and tall. So the width will also play an important role in your buying decision. The last factor to consider is whether you are sharing the sleeping bag. In this case a 2 person bag is the best option. Seasonality: This affects how warm or cool you will be while sleeping. Most are between 15 and 50°F. For summer camping you want a bag that’s rated 35°F or more and in Winter a sleeping bag with 10°F or less. 3 season sleeping bags will be between 10-35°F, meaning they are pretty good all year round bar Winter. Shape: There are 4 main shapes to consider; Rectangular, semi rectangular, Mummy or double wide. Rectangular being the more common camping bag while the semi rectangular (barrel shape) is good for both camping and back packing due to comfort and efficiency. Type Of Filling: Most campers will use a sleeping bag that is filled with synthetic materials like polyester. This is because they are cheaper, well insulated, quick drying and are generally quite durable. But don’t fold down so compact. So not ideal for space conscious backpackers. The more expensive sleeping bags will often have goose down as their filling. Ideal for back packing as they can be compacted much more. Also can be water proof if the feathers have been moisture protected. Rectangle Vs Mummy Sleeping Bags – Which Is Best For you? If you are super tall you’re going to need the tallest sleeping bag you can find. From my research, this is the Paul Bunya Series by High Peak Outdoors. Formally known as ‘The Big Foot’, this is a 100″ long sleeping bag. The only of its kind that I have ever seen. It’s huge!. 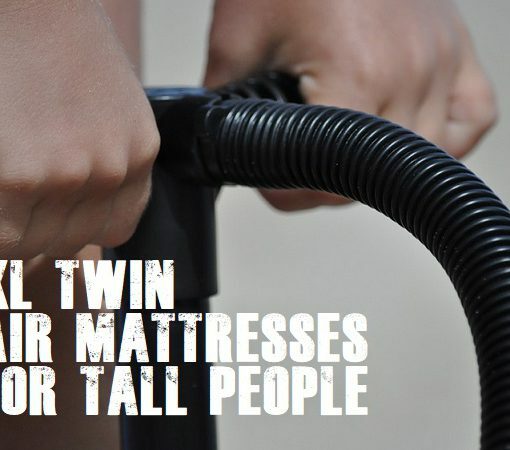 While being extremely long, as in tall enough for guys over 8 feet, it’s also a double wide sleeping bag. Meaning it can fit 2 tall people inside. Being 40 inches wide, there’s plenty of room for a couple to snuggle up on a cold night. However, if you’re after a single person bag, then look further down for more options. Rated as a 0°F sleeping bag you can rely on it to keep you warm on cold nights. But for hot summer nights, this temperature rating will probably be too warm. So take this into consideration when buying. Besides being too warm for hot nights, there is an option to leave the zipper open on your side only as it comes with dual two way zippers. This is particularly handy if you feel the heat more than your partner. If your partner finds it very snug and warm, but you feel too hot you can undo your zipper and it won’t affect her side of the bag. 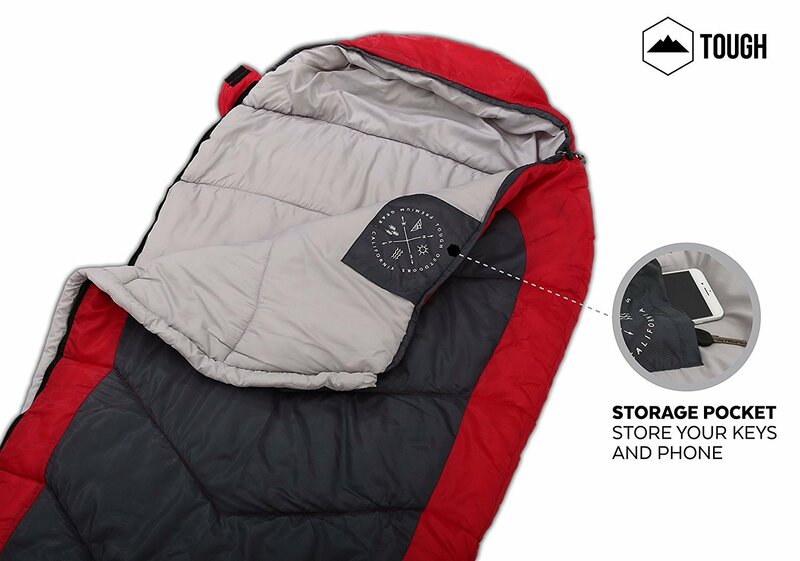 These dual sided zippers also allow you to connect two of these sleeping bags to make a giant sized sleeping bag. Only for the brave at heart tho. The zippers are also full length with a strip of insulation on both sides. This combines with the 100% cotton flannel makes it a might warm sleeping bag. The filling is a dura fiber similar to that of a wound dressing tightly compacted I believe. Because of all this padded comfort and oozing warmth, the Paul Bunya is not lightweight, weighing roughly 13-14 lbs. So it certainly is designed for car camping in comfort with warmth. Comes with tight compression carry sack. Next on the list is a quite popular big and tall sleeping bag. From it’s 92 inches in length to the 39 inch width, the Big Basin by Coleman is just screaming for big men to sleep in it. While not quite as warm as the Paul Bunya above, the Big Basin still has an impressive 15°F temperature rating. Making it a better choice for all round weather, providing you’re not planning to sleep in freezing conditions. 92 inches in length converts to about 7’6″, however you lose a little bit of length through the material thickness etc. So still a great choice for people under 7 foot. The thermolock draft tube which is a feature that prevents heat from escaping out of through the zippers. Keeping you more insulated. The Coletherm hollow polyester insulation feature and the fleece foot section help to eliminate cold spots in the sleeping bag. The adjustable hoodie can help keep you warm, but also cool on warmer nights. The two way zippers can be used to ventilate the sleeping bag during hot and humid nights. So as you can see form the measurements and few features above, the Big Basin really is designed for larger Guys and Gals. It’s especially good for keeping the sleeping bag ventilated and warm on cold nights. The fleece lined foot area is certainly a nice touch on cold nights. Within 15 minutes of laying in this you will feel right at home as if you were in your own bed. If you hate feeling claustrophobic like I do, then the Big Basin is certainly my top recommendation. It’s roomy, warm and very nice on the skin. Being such an oversized sleeping bag makes it completely out of the question for backpacking. But great for camping!. *Note: The Big Basin is intended for big and tall people, if this is not you then keep scrolling down this page!. If the idea of carrying around a huge bulky sleeping bag is off putting, then you need to check out the Norsens Compact 0° extra long sleeping bag. Measuring 90.5″ tall and 32.6″ wide with a weight of just 3.6 lbs, this sleeping bag is perfect for the single tall person with lightweight camping in cold conditions. While being rather long, it’s also quite compact if you need to attach it to your back pack or stuff it in. This is because of the compression straps. What they do is turn the regular 15″ x 7.8″ rolled up bag into a tightly compressed 7.8″ cube(roughly the height of a sports drink bottle). While still weighing just 3.6lbs and also includes a unique handle for carrying the bag around. Suitable for almost freezing conditions with temperature ranges of : 32 – 68°F/0 – 20°C; While sleep in comfort in 50°F/10°C. Outer polyester shell is water resistant to keep the inside of the sleeping bag dry and free from moisture. The ‘Fiber Lock’ construction are sewn into the bag to make sure the filling stays put and doesn’t shift around the bag. The filling is a spun cotton which gives it the lightweight rating while also being very soft and warm. Hooray for the anti pinch protection over the zippers. Draft tube that runs along the full side. Can be zippered with another Norsens to make a super size lightweight sleeping bag. Can be zipped up from the inside. For the very reasonable price, there really is nothing to fault. I think it’s probably the best sleeping bag for a single tall user. There’s enough room to roll over in and not feel constricted, but not too much space, like in a double wide, where you have too many cold spots. 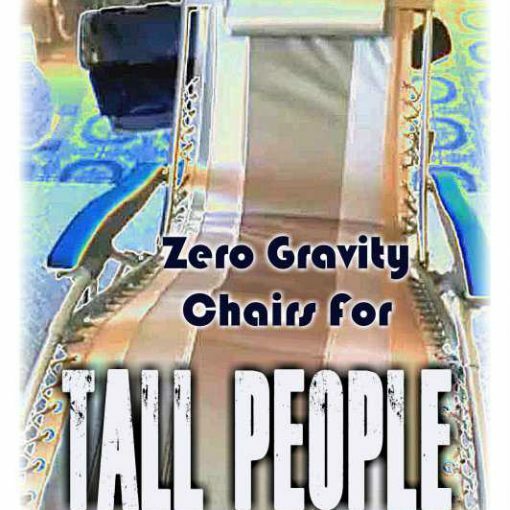 It’s just right for the tall average size American. Great for colder nights and nice and comfortable on the skin. But for freezing conditions I would look for a more winter specific sleeping bag or use an underlay blanket as well. Unlike most other sleeping bags, the Norsens zipper doesn’t catch on the material due to the zipper plow. Which is a terrific feature as it prevents rips and tears. In my opinion, one of the best sleeping bags for the money, especially if you’re a tall person. 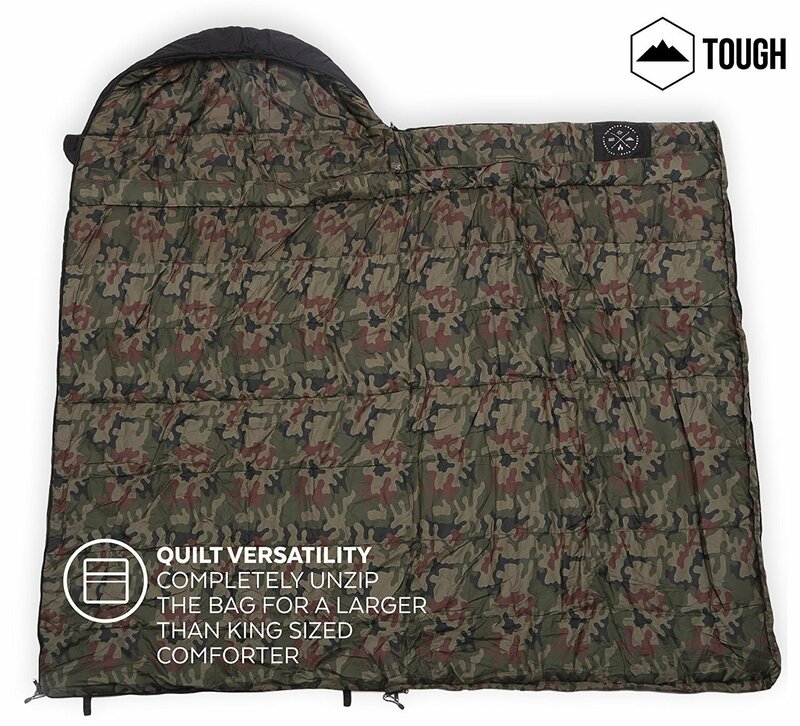 In regards to a Mummy style of sleeping bag, the longest I have experienced is the XL All Season Mummy sleeping bag by Tough Outdoors. Being 88 inches long and suitable for people up to 6’6″ tall, this all season Mummy is the ideal choice. In terms of the temperature rating this Tough Outdoors Mummy is rated to extreme conditions of 32°F, but typically has a rating of 40 – 65°F. 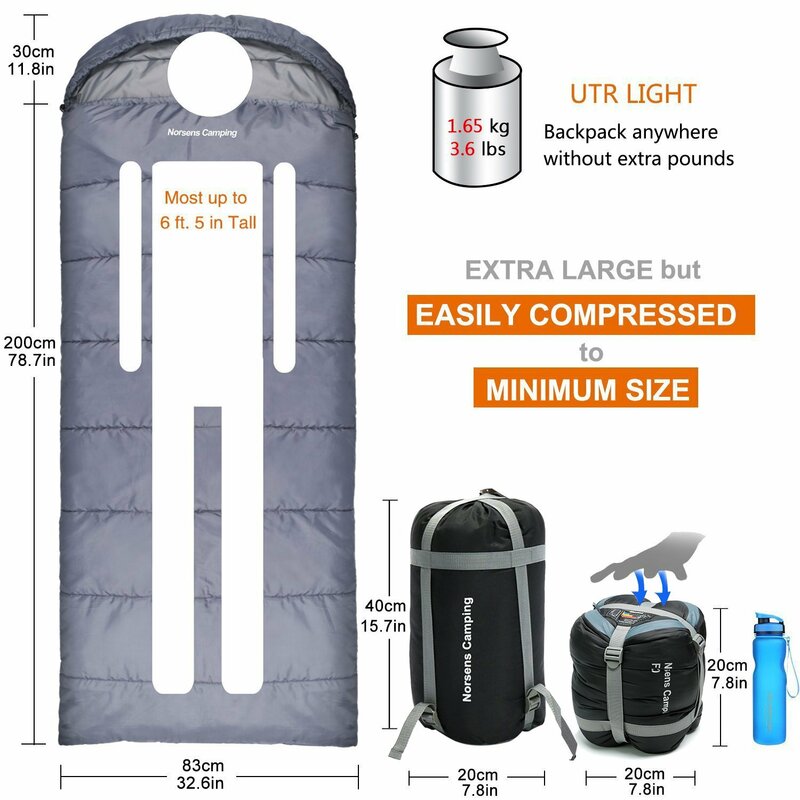 Weighing about 3 pounds and being able to be compressed makes this sleeping bag perfect for many conditions; camping, hiking, backpacking etc. The lightweight and compact unit makes traveling with it a breeze. Because it is a Mummy style of sleeping bag, further measurements may need to be acknowledged. If you have wide hips, it may be too difficult to roll over in this bag. This is when a big and tall sleeping bag would be more appropriate. The maximum width, shoulder area, is just 32 inches. So a 35 inch waistline may find it a bit too restrictive in my opinion. One of the coolest features is the built in pocket which is located in the center on the inside of the head opening. This pocket allows you to store your keys, smart phone, mp3 player etc safely. Comes in a cooler version suitable for 20 -50°F conditions. The outer material has a rip stop liner to prevent any tears and holes caused from twigs and rocks. Comes with a compression sack that will make the rolled up sleeping bag a nice compact 8 inch wide x 15 inch long carry bag. The interior liner is non-scratchy. While it’s not designed for extreme cold nights, it’s still a rather warm sleeping bag. Considering how thin the walls are, you would expect it to be less warm. But this sleeping bag almost instantly warms you up. Having zippers on the inside and outside is very handy, but I do find them to get to a point where it’s difficult to zip all the way up once you’re hands are inside the bag. If you have a large torso, you may find this bag too constrictive. But if you’re a tall slender person, it’s a great choice due to it’s lightweight, compression case and storage pocket. 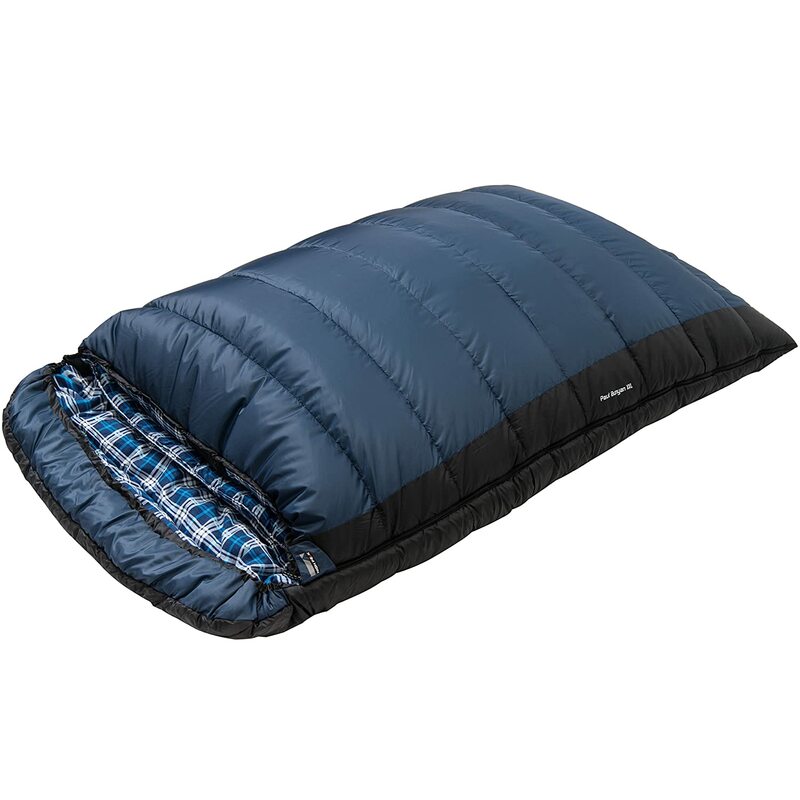 Another suitable sleeping bag for the Big and Tall, this ‘Colossal XXL’ is also by Tough Outdoors. If the Mummy style above is too restrictive and you really like your rolling around space without sacrificing leg room, the Colossal is a great alternative. With a width of 45 inches you got plenty of space to move around and roll over during the night without feeling like a ‘Mummy’. For some people this is going to be too much space, but for the average to larger Man/Woman, it’s a much welcomed feature. 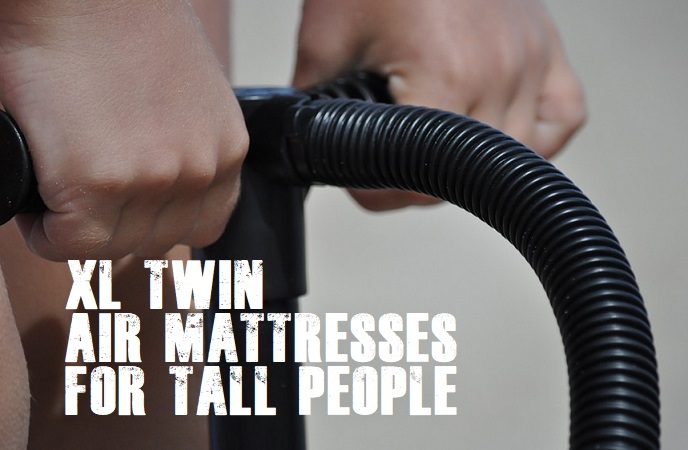 In terms of length, it’s a tall extra long sleeping bag that measures 90 inches. Which translates to 7’5″ tall. So certainly a spacious and roomy sleeping bag. Extreme temperature rating of 10°F and regular temperature rating of 20 – 50°F. Rip stop outer material to prevent tears and holes. High loft filling with non scratchy lining. Comes with a compression sack that tightly compresses the rolled up bag to 9″ high and 14″ wide. Also features an interior storage pocket like the Mummy sleeping bag. 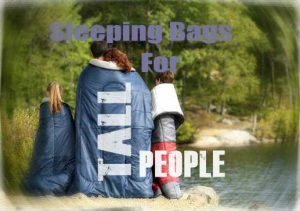 Also available in XXXL for sleeping the whole family on one bag. Is The Colossal Worth The Money? When you compare some similar sleeping bags in the tall person market while also trying to factor in lightweight features, I find the Colossal is certainly worth the money. In some cases it can cost 3 times more just to knock a bit of weight off with other sleeping bags. To me that is just ludicrous. While it may be a couple pounds heavier (total weight maximum is 6 lbs), it certainly is well worth the money. If you don’t need a lot of rolling around room during the night, then this is not the sleeping bag for you. 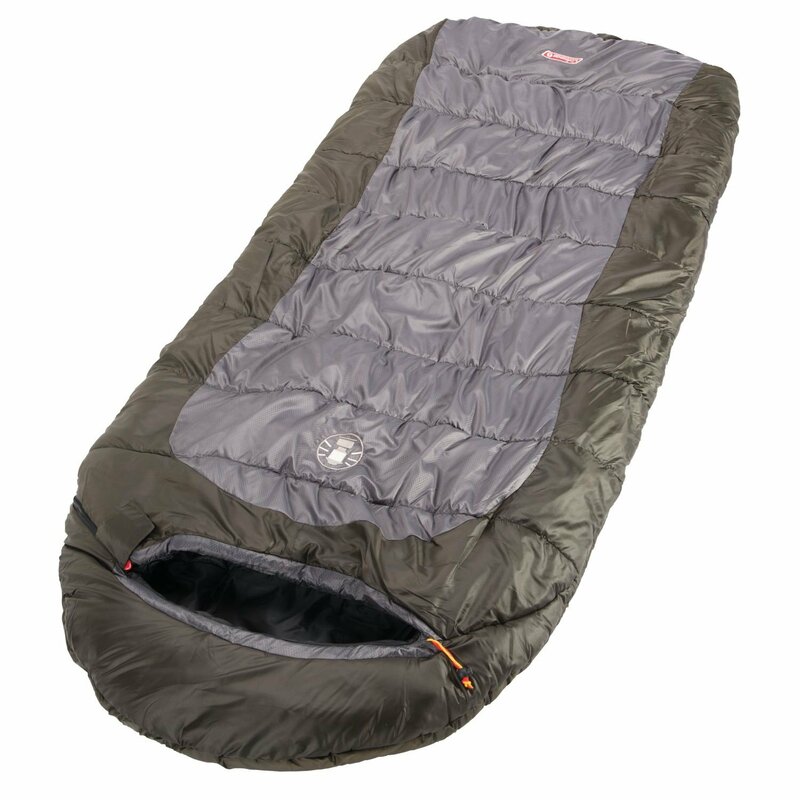 As it is one of the widest and tallest sleeping bags on the market. It’s nice and silky to sleep in while having a tougher rip-stop exterior makes it a great choice. 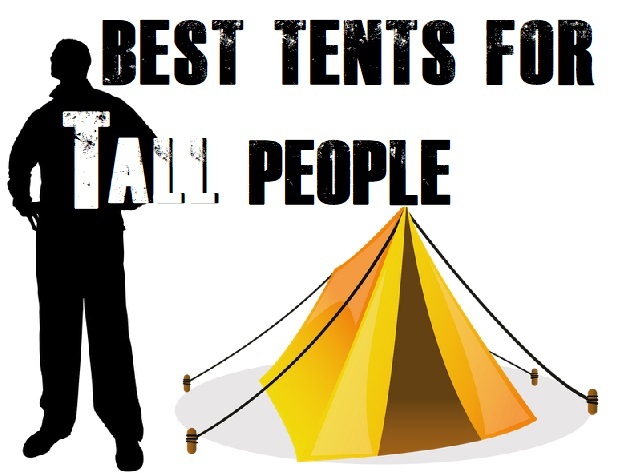 There’s some really great info here about sleeping bags for tall and/or large folks. My hubby is 6’6″ and he’s always struggled with buying things that “normal” height people don’t have to think twice about. I’m going to let him know about your site and he’ll be checking it out soon. That 100″ double sleeping bag looks like something we’d be interested in, too! Hi Susan, that’s great that you’re looking out for your Husband. The 100″ long sleeping bag certainly is a monster. I think you both will love it. 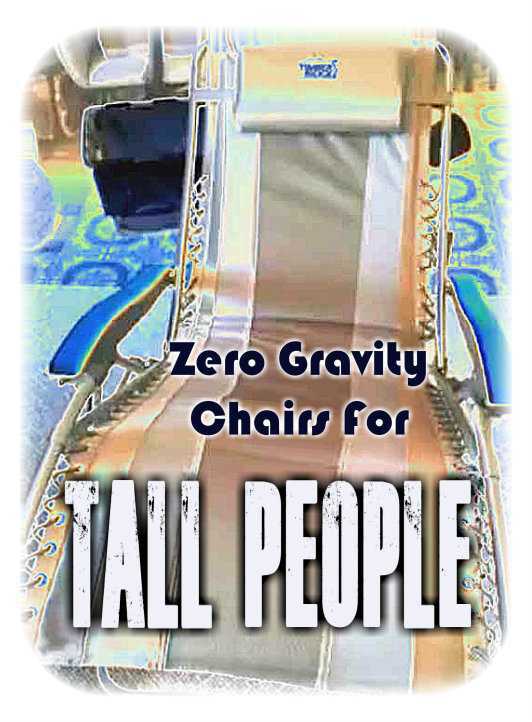 Great detailed article as I don’t have the issue with being too tall ,but I do have sister in law that has this issue and I will for sure send her to your site to get all the scoop! This sounds like a good overall site for her to check out ! I’m glad I found your website! We’ve been looking for some longer and wider sleeping bags and stumbled onto your site…glad we did. In particular, I wanted a bag that could be used by my wife and I on cold hunting trips. It looks like the Colossal would be perfect. I also wanted something that would fit perfect on our air mattress. It’s like the perfect bag for us! And it comes with a little pocket for our phones and keys…bonus! The colossal is a great choice for you guys. i love the little pocket as well. Comes in handy quite a bit. Hope you get some warm sleeps out of it. Uh yes Justin, you should certainly look into the temperature ratings before you go out camping. You really don’t want a winter sleeping bag during summer and vice versa. Great choice with the Big Basin by the way.